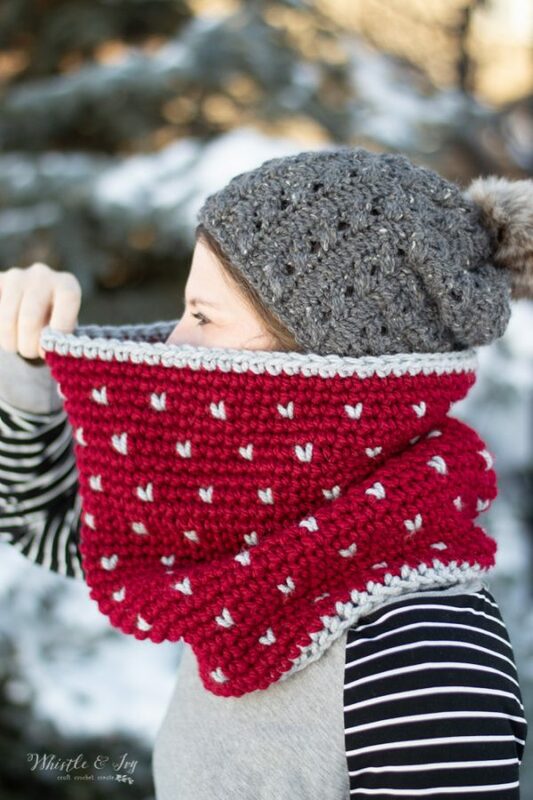 This cowl has been on my list forever ( having a clone or two of myself would come in real handy…). I originally started it with different yarn, but I decided to go with this chunky yarn instead and it turned out lovely. I love projects that I can complete in a couple evenings. I am very tempted to line this cowl with faux sheepskin like I did with my plaid cowl. If I do, I will share new photos! 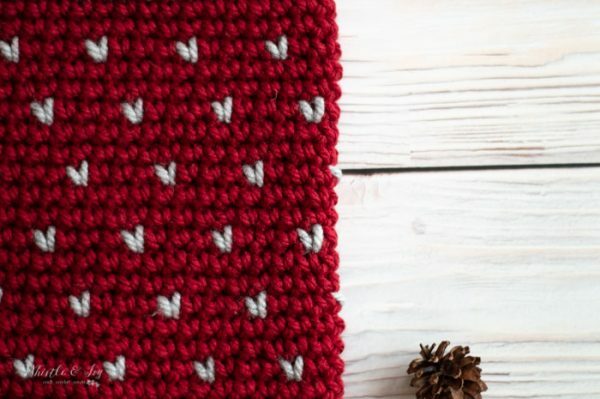 The beauty of this fair isle cowl pattern and the snowfall stitch technique is that you can size this up or down very easily. If you are wanting to use chunkier or thinner yarn, it will work perfectly, just make sure your foundation is approx. 28″ long and is worked in multiples of 4. 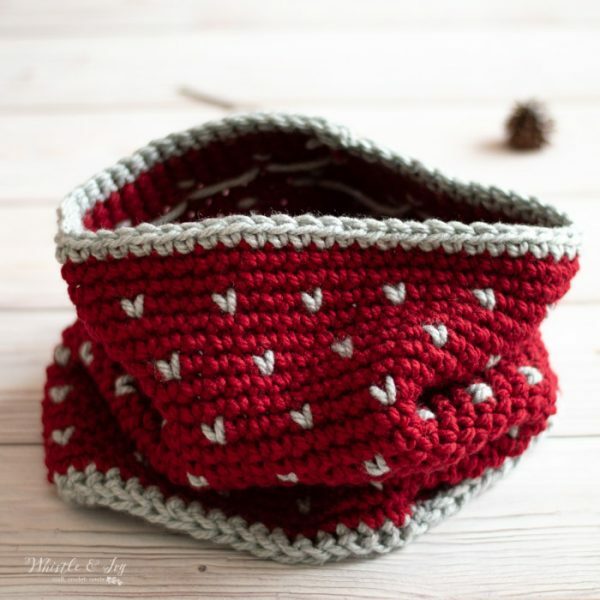 Please remember: You are free to use this fair isle cowl pattern to make and sell, but do not republish or distribute this pattern in any way. DO NOT use my photos in your listings. 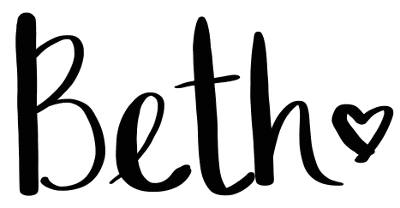 Please do share my blog links! 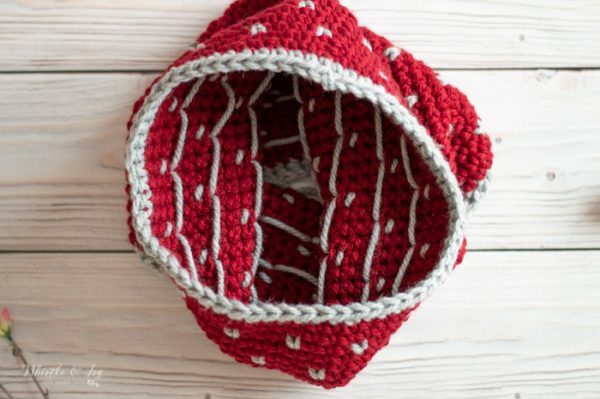 It’s a quick and FREE way of supporting Whistle and Ivy and more free crochet patterns in the future. 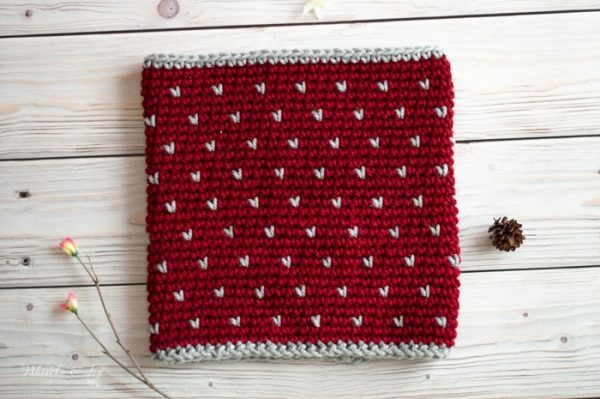 Note: You can work this cowl pattern using either the fair isle technique or the tapestry technique. I used the fair isle technique as it prevents the carried yarn from peaking through, but it makes the inside a bit messier, so you will have to choose for yourself! If you decide to go with fair isle, resist the urge to tighten the gray stitch. It will seem big and loose, but once it gets worked it, it will pop nicely. Also, for some reason, my creative juices told me to work 2 rows of sc in leu of one row of DC as I usually do with the Snowfall Techinique. 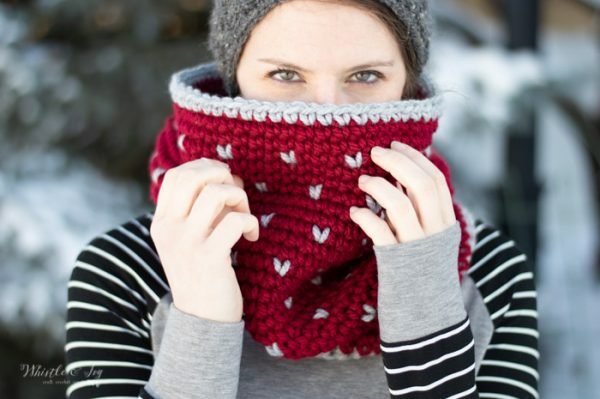 The cowl will work either way, but if you choose to work the DC row, make sure it counts as both rows of sc that are worked between the snowfall row. 1. Begin with a long tail. With Heather Gray, Work a sc foundation of 60 sts. Join into a loop. Watch the video below on how to work a foundation stitch. (if the video doesn’t load, please disable your adblocker). Tie off and weave in top end. Turn your cowl upside down and going back to the original foundation, using your beginning tail to sew up the bottom of the first and last sts of the foundation. Weave in your end. I did your survey. Copied the code and then by mistake copied over the code. 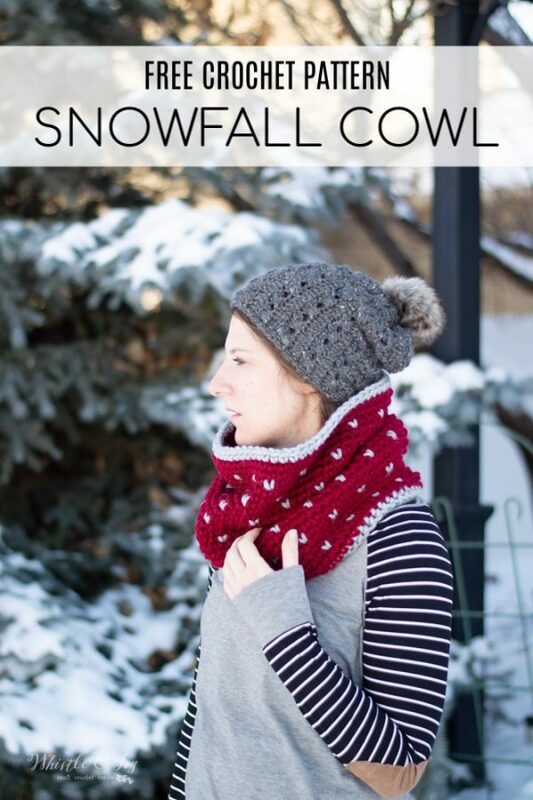 Can you send the me the code again or this is the pattern I was trying to get “Snowfall Slouchy Hat” to go with the Cowl pattern you offered in your news letter. Thanks for your help. Through reading others posts and trying to remember code I finally came up with it and it worked. Thanks for replying. I just love it!!!! It will be on my hook this afternoon while I’m watched by my team play and win. The SAINTS are going to the Super Bowl and WIN IT!!!! Yay!! Wahoo, I looked it up and saw they won, congratulations!